Another season, another tin of powdered drink mix. Despite a wealth of previous data suggesting that Trader Joe’s should not be powdering drinks and selling them in cans, they’ve gone ahead and done it again with Trader Joe’s Gingerbread Latte a “naturally flavored” drink mix. The result is predictably terrible, BUT it’s also surprisingly awful. Yes, a bit of a mixed bag with this one. What it is: Terrible, flavored coffee mix. Price: $4.49 for a 10 oz. tin. Do not buy, drink or serve Trader Joe’s Gingerbread Latte Naturally Flavored Drink Mix. If someone else buys it for you or serves it to you, you should come up with some way to punish them. (Throw a cup of cold water on them while they’re in the shower?) If they drink it themselves, just leave them alone – that’s punishment enough. Trader Joe’s has disappointed before with similar powdered drink mixes – such as their Tropical Green Tea Powder, and Green Tea Matcha Powder, both of which were unpleasant tasting, messy, and bad for you. This Gingerbread Latte Mix is all that and more. The first thing I want to bring up is how fatty and sugary this stuff is. There’s a lot I can forgive in a healthy food. As I’ve written about before, you have to grade health food on a curve. If Trader Joe’s is serving you some low-cal spinach dip, it’s not fair to hold it up in comparison to a full calorie, and undoubtedly more delicious, spinach dip. To a point, you’re not buying diet food for the the taste, you’re buying it because you’re on a diet. Well, as far as I’m concerned, the opposite case is in effect with high-cal, fattening food. I will gladly eat you, you globs of sugary fat, but you’d better taste good enough to justify it. For instance, if you’re going to serve me unpalatable kale chips as a replacement for Doritos, they had better not have more calories than the Doritos. This Gingerbread Latte is the absolute textbook case of something not being worth the calories. 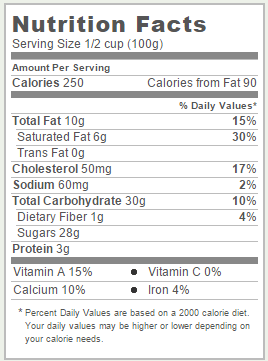 In each 28 gram serving of drink mix, there are 20 grams of sugar, and 6 grams of fat. The other 2 grams? The coffee and spices I guess. This is literally nothing but sugar and fat, and tastes terrible. Terrible and feeble. If you pour enough of the drink mix into a cup of hot water in it will taste sweet, however any sort of gingerbread taste, or “notes of ginger, clove and cinnamon”, are completely masked by the awful artificial creamer stuff that makes up the bulk of this mix. This dried creamer consists of coconut oil, lots of maltodextrin, and all sorts of other gross powders used to artificially render a sort of quasi-dairy taste into white, shelf-stable powder. Fine, yes, it has artificial creamer in it. That makes it bad coffee, but God knows I’ve resorted to artificial creamer more than once in my life. The real problem is that this creamer simply does not dissolve – not in water, not in milk. Heat it all you like, stir it up all you like, leave it to sit as long as you want – you’ll still be left with scores of tiny, undissolved flecks of some oily substance – little globules that scum up on top of the coffee and stay plastered to the side of your mug when you’re done. This latte mix is cheap and it’s terrible and it tastes bad and it’s bad for you. If you need to wake up in the morning and this is all you have in the house, just slam your hand in the oven and go to work. At least there are fewer calories that way. I’m not saying don’t drink hot cups of spiced coffee over the winter, I’m saying you can do better than this. Hell, you can do better than this in your own kitchen with some coffee, whole milk and cinnamon-sugar. Or just go to Starbucks, if you don’t care about the calories. That Starbucks coffee is pretty good – and it’s waaaaaaay better than lame excuse for a pick-me-up. Even the Trader Joe’s instant powdered coffee stuff is way better (As we’ve talked about before with Trader Joe’s powered coffee packets). The general point I’m trying to make is, I don’t like this latte mix and I wouldn’t recommend purchasing it. I could go, but it’s almost time for the next blogger guy to come in so I’d better wrap things up. To ensure a happy holiday season, skip this stuff. Would I Recommend It: Hmmmm, no. Final Synopsis: Really gross instant coffee. These words should not appear next to each other. Trade Joe’s has a variety of gyoza, from the ordinary chicken and pork gyoza, to the more adventurous thai vegetable and green curry shrimp gyoza. I may have preferred some over others, but personal taste aside they’re all pretty great. Worth it: No. A weird mix of flavors. The number of success the Trader Joe’s R&D department has racked up in this category seems to have egged them on to Kanyean levels of hubris. Surely only the iron-clad belief that your every move is golden could lead someone to put out a product titled, and I quote, Whole Wheat Butternut Squash Gyoza. That is simply a combination of words that shouldn’t appear next to each in print, let alone on an ingredient label. 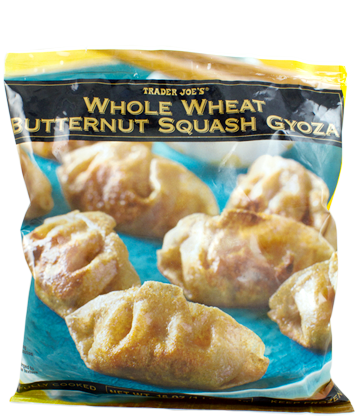 In short, out of all of Trader Joe’s delicious gyoza offerings, Trader Joe’s Whole Wheat Butternut Squash Gyoza simply does not work. Let me start by first reiterating my stance that I think experimentation with food is one of finest endeavors undertaken by man. By all means, let us mix, match and blend weird things together. Just make sure you taste test it first before releasing it to the general populous. There are certain elements that make a gyoza (or potsticker) delicious, and to just discard those things is to invite disaster. Take, for instance, the dough of the dumpling. 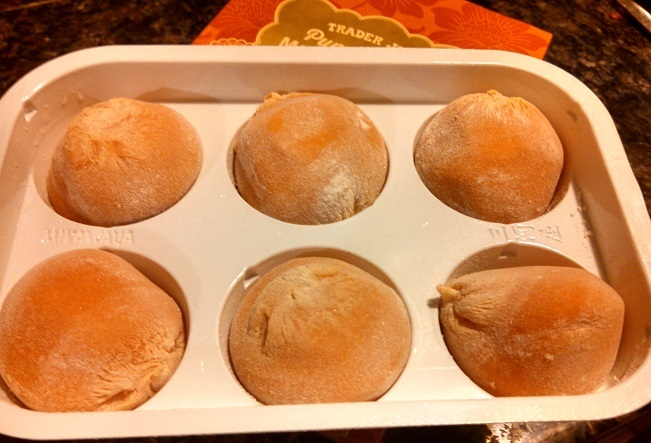 All of Trader Joe’s other gyoza stick to the same, standard glutinous wheat dough wrapping – and for good reason. More than anything, more than even whatever contents it wraps up, the doughy exterior of a dumpling is what makes it delicious. Chewy, yielding and supple, with a bit of pan-fried crisp along the bottom edge, this is what makes a well-cooked gyoza simply irresistible. Swapping out that award-winning dough for a whole-wheat based variety may be a more healthsome choice, but it simply doesn’t work as well as a dumpling. The whole wheat wrapping is much thicker and more textured than the usual gyoza dough, and tastes of the bread-y nuttiness of a slice of whole wheat bread. It’s not bad, to be honest, but it certainly doesn’t scratch that gyoza itch like their other offerings. If the filling of the gyoza where something more usual, I might be able to find a place in my heart (and freezer) or these pot stickers. Unfortunately, they decided to fill them with a strange combination of mashed butternut squash, whole edamame beans, carrots, sweet potato and Japanese green pumpkin (kabocha). The result is a squishy, sweet squash mash with big beans in it. It’s not bad – on its own – but it’s hard to imagine something more wildly different from what is normally put in gyoza. Instead of a filling with a bit of body, maybe something savory or rich, you basically get sweet mashed potatoes – mashed potatoes with whole soy beans stuck in ’em. It’s a very, very odd combination, and it didn’t work for me at all. Between the weird dumpling and the weird filling there just wasn’t anywhere to get my footing. I couldn’t even figure out a condiment that worked well with them. Typical gyoza dressings (soy sauce, vinegar, red pepper sauce…) simply did not work with these lumpy hybrids – the sweetness of the stuffing, and the squishy consistency, made them clash with everything I tried. Maybe if I had some spare gravy on hand I could have whipped up a batch and eaten them like an Asian-fusion Thanksgiving side. Overall, I just found these baffling. While the sweet squash filling is fine on its own, it’s not what I’m looking for in a gyoza, and the whole-wheat wrapping feels completely out of left field. Maybe if these had been marketed as a type of whole wheat pirogi, and the soy beans had been left out, it would have been a bit easier to understand. As it is, unless you’re holding that Asian-fusion Thanksgiving dinner I mentioned, I can’t think of a reason why you should pick these up. Would I Recommend Them: No. They’re not awful… but they’re just not all that good either. Would I Buy Them Again: Only to avoid hurting someone’s feelings. Final Synopsis: A swing…and a miss. The bag looks like they’re being serious – but these chips are a joke. Now that the season of pumpkin madness has subsided, and the cooling winds of dark November have arrived, I can finally catch up on a backlog of other, truly out-there Trader Joe’s products that they tried to slip onto the shelves without anyone noticing. The craziest addition has to be Trader Joe’s Ghost Pepper Potato Chips. This new addition to the snack section may well be the biggest let down of any Trader Joe’s product to date. What it is: Not very spicy potato chips. Worth it: No, not if you’re looking for spicy chips. If Trader Joe’s has a failing, it’s that it sometimes over promsises. That’s unavoidable for a group that dreams as big as they do – bringing us such exotic oddities and far-flung favorites as frozen Kouigns Amann, Tamil Uttapam and, of course, the wonders of Scandanavian Cookie Butter. I’m deeply grateful there’s a mainstream grocery store that regards the average American consumer highly enough to gamble their business on such unusual products. On the other hand, sometimes they come out the gate with what sounds like a great idea but absolutely fail to deliver on it. It’s like the Marketing team gets really excited and doesn’t listen to what the R&D guys are telling them. The result is packaging that signs a check the contents simply cannot cash. That’s absolutely the case with Trader Joe’s Ghost Pepper Potato Chips. It’s commonly known that the Ghost Pepper is the absolutely hottest pepper in the world. Not just hot, and not just really hot, but like legendarily, pinnacle of the pepper pyramid hot. It’s weird that most people seem to know this, but they do. Every now and then the populous at large latches onto some bit of esoterica that seems like it should otherwise be languishing in obscurity. Keep your jalapenos and keep your habaneros, the people say, if you’re looking for pure, tongue-blistering, utterly unenjoyable HEAT, you want a ghost pepper. Just in case you need a refresher on the spiciness of peppers, there is a more-or-less scientific scale that was devised to measure the relative hotness of peppers. Called the Scoville Scale, it measures the spiciness of peppers in so-called Scoville heat units, or SHU’s. A nice sweet bell pepper comes in at 0 SHUs. Banana peppers are about 100 units, a good jalapeno pepper is about 1,000 SHUs. The pepper referred to as the “Ghost Chile”, on the other hand, weighs in at 2 million SHU’s or more. Just by way of comparison, some law-enforcement grade pepper sprays only contain about 500,000 SHU’s. Four times hotter than pepper spray – that’s the ghost chile for you. So what in heaven and hell could Trader Joe’s have been thinking when they released the absolutely mildest, gentlest “spicy” potato chip I’ve ever tasted? I’ve spoken at length before about my light weight, or “chili wuss”, status when it comes to spicy foods. Pace brand Mild salsa is sometimes a little too hot for me. As a rule, I avoid the jalapeno potato chip. If I happen to munch down a couple by mistake I usually have to take a long break to fan my mouth. My brothers and cousins can all pile them into their mouths by the truck full, but even the gentler brands often leave me sweating. I bring this up because even I find these ghost pepper potato chips contemptuously mild. They’re only spicy in so far as they suggest the notion of spiciness. If you smell the bag, you might think “Oh, these smell like they might be slightly spicy”. Savor that feeling, because that illusory impression is as spicy as these chips get. Bite into one of these cross-cut “lattice” style chips and you’ll catch just a hint of peppiness that immediately fades out and leaves you with basic, plain ol’ potato chip taste. I’ve had BBQ flavored potato chips that are spicier. That’s not to say these potato chips are bad – they’re just bad at being spicy. The potato chips themselves are very satisfying to snack on – the thick, waffle-cut chips are very crispy and crunchy and entirely munchable. I found the mild spiciness to actually be a nice alternative to the spicier mainstream brands, in the same way that Trader Joe’s Sriracha sauce is a nice, less-spicy alternative to Hoy Fong Sriracha sauce. Finally, an only-sorta spicy potato chip I can enjoy! I just never thought I’d find them under the guise of ghost pepper chips. If TJ’s had billed these chips as “Mild Jalapeno Flavor”, or “Potato chips – With Just A Touch Of Heat”, I would be writing a very different review right now. But by calling them Ghost Pepper Chips, and then doubling down on all their website and product copy about how insanely hot they are, Trader Joe’s is just making a fool of itself. Do not be suckered in by this marketing gimmick – unless you’re looking for a mildly spicy potato chip, these will disappoint you. Would I Recommend It: Only to people who like not-particularly spicy potato chips. Would I Buy It Again: Yes. I’m going to ignore that these say “ghost pepper” in the title and just put them out for parties. Final Synopsis: It would be hard for these potato chips to be much less spicy. Beautiful tin, great spicy scent, same old underwhelming rooibos tea. You guys know me – I never miss a chance to talk about rooibos tea. 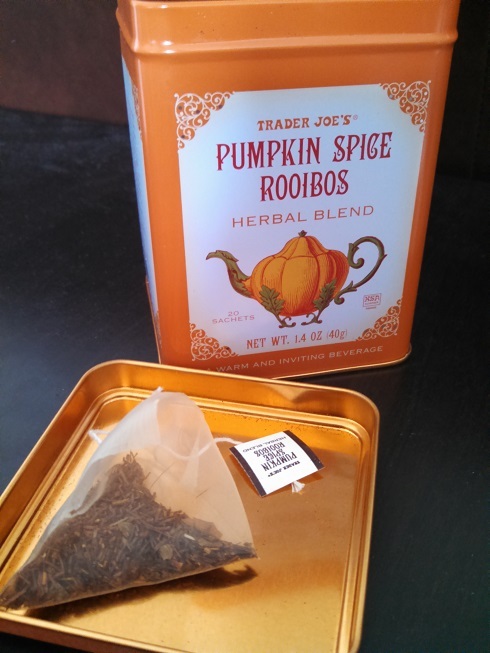 What a surpise, then, to see that Trader Joe’s has brought out a new Pumpkin Spice Rooibos herbal tea! The tin looks very nice – but this is rooibos tea we’re talking about. Is there anyway it can live up to the pretty packaging? Frankly, no – not at all. While it’s an improvement on other types of rooibos tea, it’s still just not that great. Generally, when you spend enough time with a food product, no matter what your initial reaction is, you tend to warm up to it. I’ll share a story with you. The Japanese produce a food called natto, which is a “fermented” (read: partially rotten) slag of soy beans. Natto is typcally served in these little styrofoam bowls, about the size of a cassette tape, and when you crack one open all you see is this beige, lumpy, nobby, sticky, slimy mass of tiny, fetid soy beans. You’re then supposed to stir it up with chopsticks, which makes the gooey beans froth up into a white, stringy mess – almost like a thick tangle of spiderwebs mixed into the beans. I’m not even going to describe the sound or smell it makes when you stir these up. The taste is, as you can probably guess, gross and slimy and sticky. In short, it’s a food that offends all 5 senses – a foul-looking, foul-smelling, foul-tasting, gross sounding mess with a repulsive texture. Sometimes people like to crack a raw egg into it. After living in Japan for a time, and being surrounded by the natto-eating Japanese, I eventually came to enjoy natto myself. It took about 18 months of extended exposure, but even to this day I will still pick up natto from local Asian market and have it for breakfast. My point is that, after extended exposure, I was eventually able to appreciate the acquired taste for natto and even came to enjoy it. Yet despite numerous tries and repeated attempts, I am absolutely unable to apprecieate rooibos tea on any level. It’s simply the lamest drink on the planet. Maybe the difference is that natto, for all it’s shortcomings, is at least a taste. Rooibos tea, on the other hand, tastes like wet cardboard. That’s not meant to be a put down on rooibos, it’s simply the most descriptive phrase I can think of. Rooibos tea tastes exactly like wet cardboard – and coming from a guy who ate his fair share of pasteboard story book covers as a child, I know what I’m talking about. Of course, what else would you expect from rooibos tea? After all, the rooibos bush, from which it is cut, basically just a dry collection of scrubland twigs, and rooibos tea is just some of the twig shavings from that bush. Yes, twigs! You’re boiling twigs! Look at what you’re doing people! And sure, I suppose you could say that we’re just “boiling leaves” when we make ordinary tea – but the difference is that there’s a long history of delicious edible leaves (Uh, Spinach? I’m looking at you! ), and no record at all of delicious twigs. In fact, I’d say anytime you find yourself eating or drinking twigs, that’s a sure sign that you’re doing something wrong. Look, it’s absolutely telling that Trader Joe’s keeps coming out with versions of rooibos tea that are rooibos…and something else. Trader Joe’s Rooibos and Honeybush tea was certainly an attempt at trying to make these twigs more palatable, This new Pumpkin Spice Rooibos tea does a much better job of it, adding to the rooibos cinnamon, nutmeg, cloves and pumpkin flavor. Trader Joe’s is definitely onto something here! These traditional pumpkin pie spices add a delightful scent to the tea, and lend it a spicy, nuanced flavor tea. They just need to follow the trend and next time leave the rooibos out entirely. A pumpkin spice herbal tea that doesn’t also taste like wet cardboard? That’d be incredible. As it stands, this tea is palatable in so far as you can ignore the rooibos part. Everything else but that is nuanced and pleasantly invigorating and seasonal. I’d certainly praise this as the best rooibos tea I’ve ever had, but that is faint praise indeed. If you’d like to drink a nice cinnamon spice tea this isn’t exactly that, but it’s close enough that it may satisfy you. However, I would strongly advise you to try some of Trader Joe’s much stronger Vanilla and Cinnamon Black Tea or delectable Spiced Chai instead. If you prefer an herbal tea, then definitely go with Trader Joe’s Herbal Blend Harvest Tea – a seasonal blend so good that I literally count the days for its return. Or go ahead and try this pumpkin spice rooibos – just don’t come complaining to me when you throw out the tin before you finish it. Would I Recommend It: No, there are better teas at TJ’s. Would I Buy It Again: No man, it’s rooibos tea. Final Synopsis: A good cinnamon herbal tea, undermined by bland rooibos. Your choice for a surprisingly pumpkin-free taste. If you’ve made it this far through October, and you haven’t tired Trader Joe’s Pumpkin Ice Cream yet, I would be surprised. Who could resist the unusual appeal of that bright orange tub winking at your from the frozen food section? It may only come around once a year, but Trader Joe’s sweet and creamy Pumpkin Ice Cream is an annual must. What it is: Cinnamon and nutmeg flavored ice cream. Worth it: Yes, it’s hard to stop eating! The fact that Trader Joe’s doesn’t carry strawberry ice cream, but it does carry pumpkin ice cream encapsulates the feeling of the store better than anything else I could write. 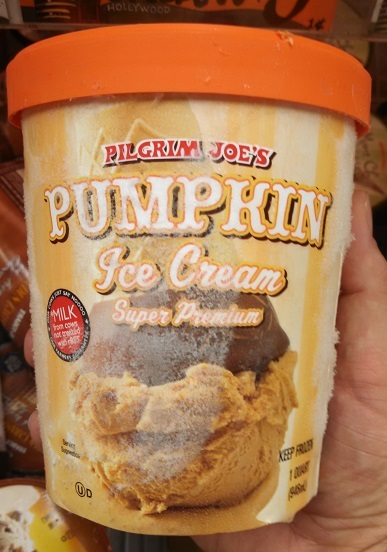 Of all the products Trader Joe’s shoehorns pumpkin into it, brilliantly or otherwise, Trader Joe’s Pumpkin Ice Cream must have the broadest appeal and biggest fan base. Classic and unexpected at the same time, pumpkin ice cream just seems like a natural accompaniment to any harvest time festival you can name – from corn husking to Halloween. I’ve written before that you never quite know what you’re going to get with a Trader Joe’s pumpkin-infused product. Sometime it will be absolutely bursting at the seams with pumpkin taste, while other times it will be pumpkin-y in name alone. 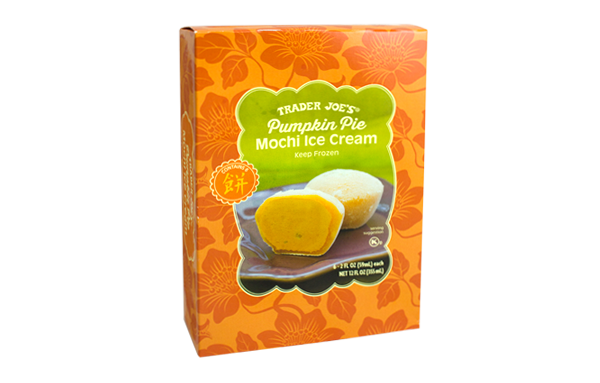 Trader Joe’s Pumpkin Ice Cream falls squarely into this second camp. It might be rich, creamy and decadent soft serve – but is it pumpkin flavored? Not really. Even in spite of the inclusion of “pumpkin” as one of the ingredients listed ingredient (as one part of the “pumpkin base”), there isn’t much pumpkin flavor to be found. Savor it on your tongue, let it melt there, and you’ll detect maybe a hint of pumpkin-ness around the edges. More correctly, Trader Joe’s should call this Pumpkin Pie Spice Ice Cream, which is much more what it tastes like – like a very creamy vanilla ice cream infused with cinnamon and nutmeg, tempered with a hint of cloves and ginger. It’s a broad, warm, mouth-filling taste – the soft, mellow flavor of the cream taking all of the bite out of the spices but keeping their warm, harmonious flavor. Trader Joe’s compares this ice cream to pumpkin pie filling on the side of the carton, and that’s not really true at all. There’s nothing like the rich taste of pumpkin in this confection – but that’s not to be held against it. I, for one, would love to have a slice of warm pumpkin pie with a scoop of this ice cream decadently melting across the top. Long story short – there isn’t much pumpkin to this pumpkin ice cream, but that’s not the end of the world. Think of this as “cinnamon and nutmeg” ice cream instead, and you won’t be disappointed. Would I Recommend It: Yes, sweet and tasty. Would I Buy It Again: Sure, I’ll get some more next year. Final Synopsis: A soft, creamy, cinnamon and nutmeg ice cream.